I can’t tell you how excited I was when I was given the news that I would be reviewing a Mamas & Papas Tour Lightweight Stroller. (I was sent a sample free of charge, in exchange for my honest review.) I have a love for strollers the way that my husband loves cars, and it is no secret that I love, love, LOVE the Mamas and Papas brand. 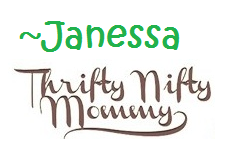 Mamas & Papas is known as “Britain’s Favorite Brand,” but it’s known around our house as Thrifty Nifty Mommy’s favorite brand as well! I’ve had the pleasure to review a number of items this year from Mamas & Papas including their new line of clothes and the adorable George Giraffe! 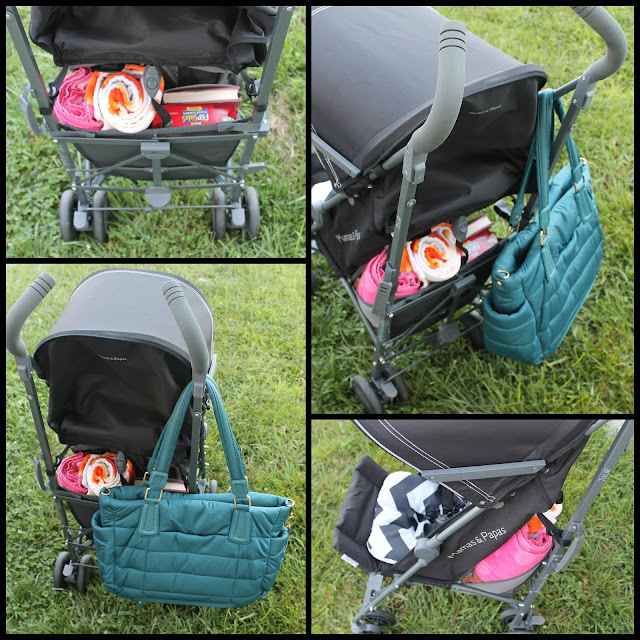 With ever new product I review from Mamas & Papas, my love for this company grows. When the Tour arrived, I literally took it out of the box right away–I was so excited to see it in person. Luckily for me, assembly was extremely easy. The wheels were already in place; I just needed to attach the canopy, cup holder, and black and white chevron liner. Attaching the liner took the longest, but I was still ready to stroll in under 10 minutes. 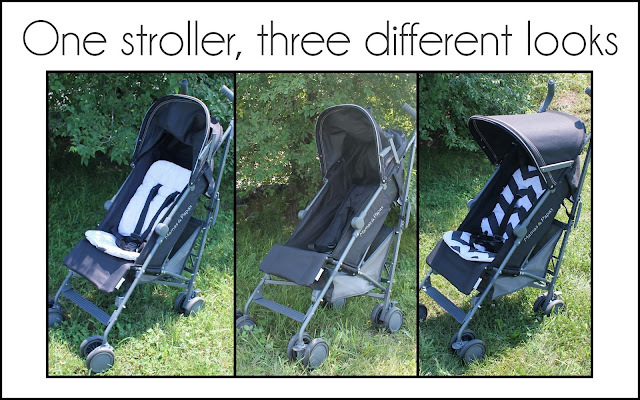 The first thing that will pop out at your is the stunning look of this stroller. It is simple, modern, and chic. My husband agrees that it is perfectly suited as a “man’s stroller” as well. Some of my strollers he’s not as keen on taking when he has one or both of the kids by himself. He loves this one however, and it will probably be his new go-to stroller. 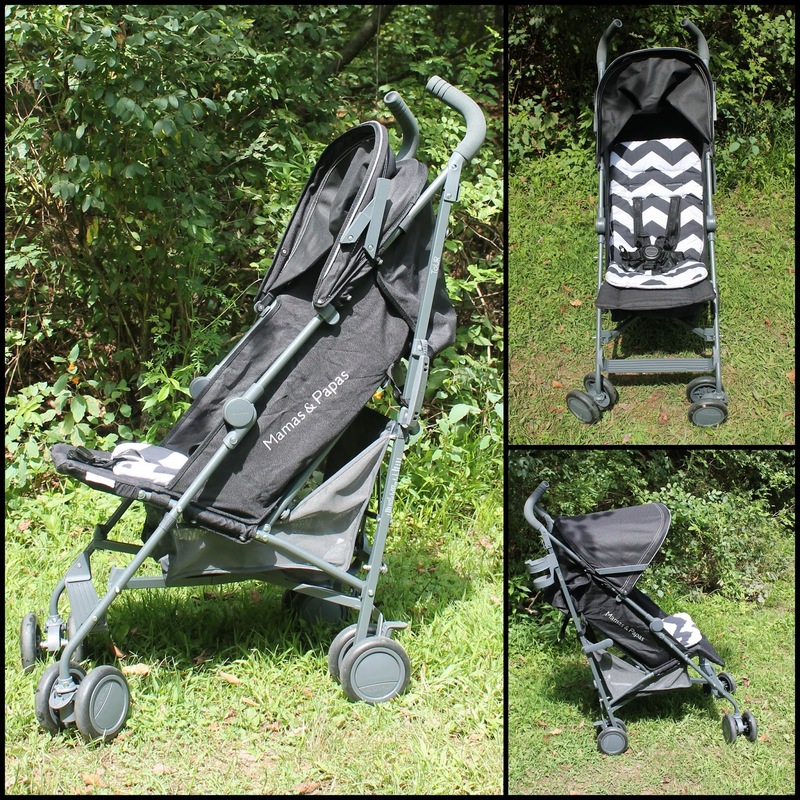 Thanks to the included chevron print insert, you can essentially get three different looks out of this one stroller. Let’s get right into talking about all of the great features of this stroller–starting with the fact that it is made for travel. It just so happened that my family but was going camping a few days after this stroller arrived, so I took this stroller along and really got to use it a lot. 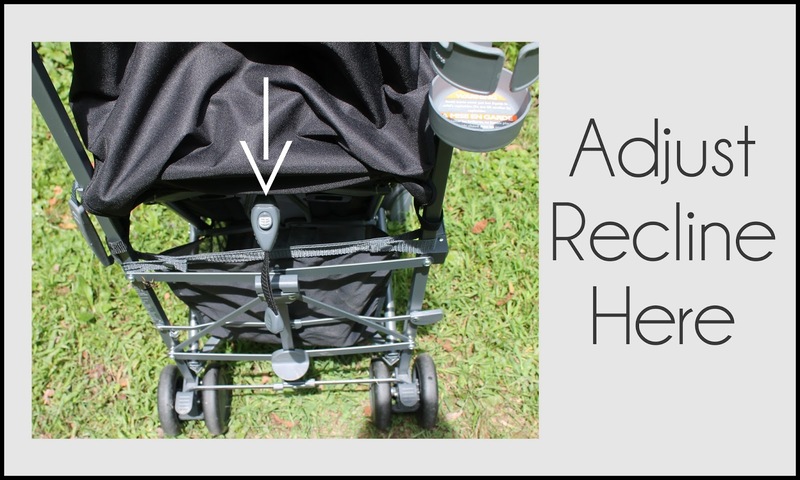 If you passed this stroller in the mall or on the street, you probably wouldn’t notice this great little handle located on the side of the stroller frame. When the Tour is collapsed, the handle, combined with its mere 14 pounds of weight, means carrying it is a breeze. 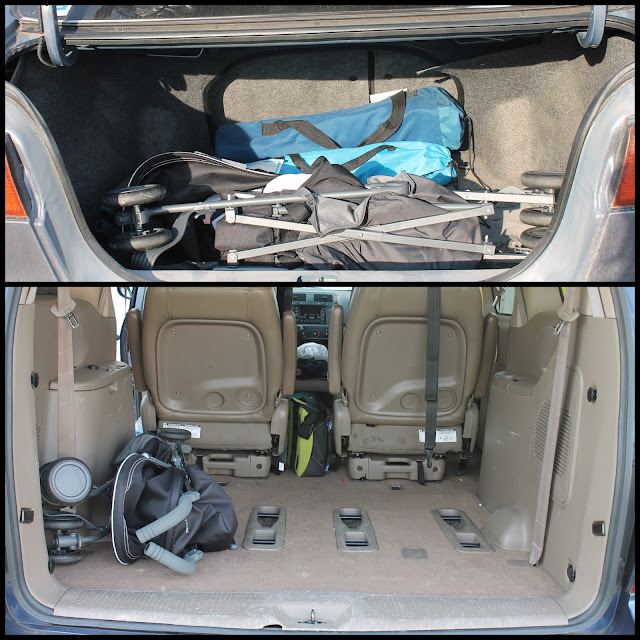 We had our minivan loaded down with supplies for camping, and it was nice that the Tour did not take up a lot of precious cargo room. Even if you have a very small car and trunk (or “boot” as the British would refer to it) you’ll have room for this stroller. The downside to having a small umbrella stroller is that usually there is not a lot of room for a basket. Although the basket is not going to be as big as you would find on a full size stroller, I was impressed with the cargo capacity of this one. I was able to fit a few beach towels and snacks in our basket when we walked to the lake during our camping trip. There is an extra tall back on this basket that helps keep items where they belong, even when you have it loaded down with supplies. 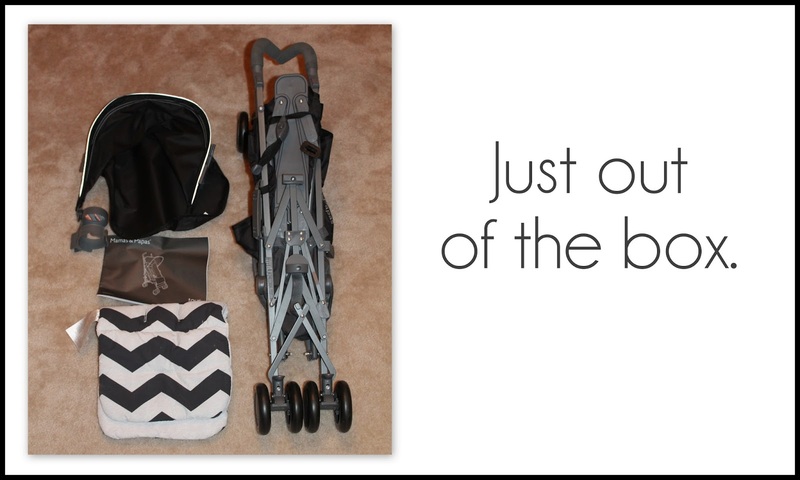 Some strollers scrimp on the accessories, but not the Tour. 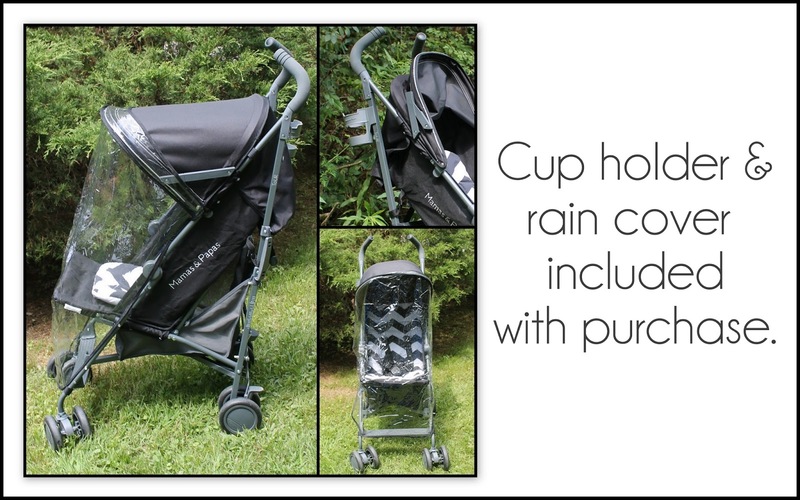 It comes standard with a cup holder (which is easy to attach and detach) and rain cover. I can’t tell you the number of times I’ve been out with my kids and it started to rain. Having a rain cover for my stroller is now a must-have. We store it in the basket and it takes up hardly any room at all. I only have one small complaint about the Tour and that is the umbrella canopy. I wish it could be extended further for days you are spending large amounts of time in the sun. However, if you need additional protection from the sun, you can purchase a universal sunshield with insect net from Mamas & Papas. The canopy is still standard size and adequate for most situations. There is a feature about the canopy that I love however. 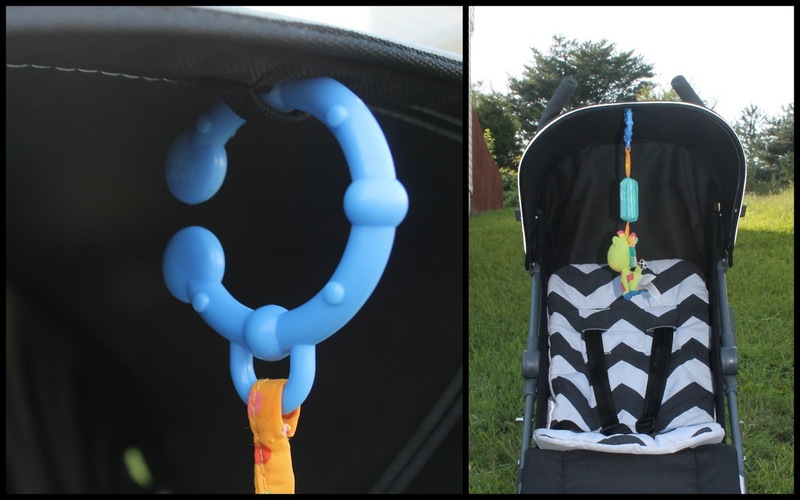 You’d have to look really closely to spot this, but there is a small place where you can attach a toy for your baby; what a great idea! You’ll love the ergonomic foam handles on the Tour. This stroller is so enjoyable to push. I’ve pushed other umbrellas strollers that left my back aching. I don’t have that problem at all with the Tour. 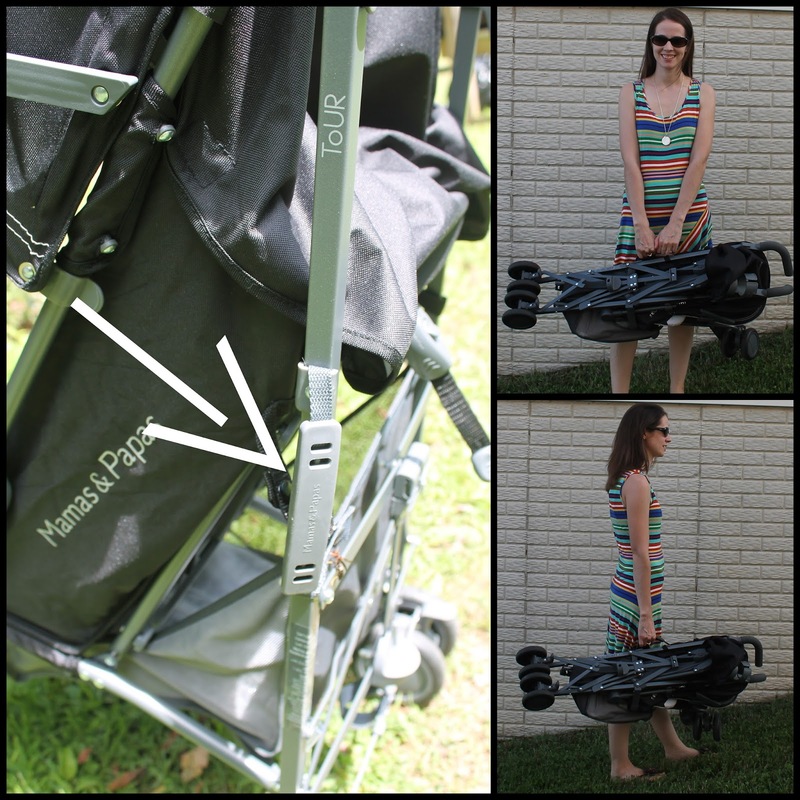 When we camped, my in-laws were with us and my mother-in-law remarked at how nice this stroller was to push. She would like one for herself! I pushed this stroller on grass, gravel, blacktop, and even sand while we were camping. While, of course, some of those surfaces were easier than others, it handled all of those terrains pretty well. Maybe one of the most important questions is how comfortable this stroller is for your child(ren). My 3 year old daughter is old enough to tell us how she feels in a stroller. Although generally she is “too big” to ride in a stroller now and prefer to walk until her little legs give out, she said this stroller is comfortable. 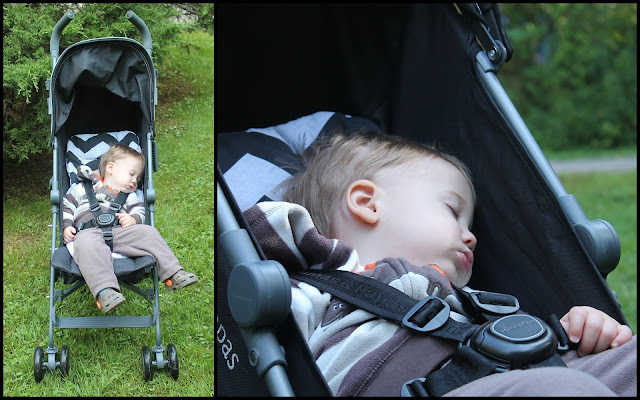 My son fell asleep twice in one day riding in this stroller, and both times we had not been walking for very long. I think that speaks volumes about how comfy it is! If you have a child who has fallen asleep or you would like them reclined for any other reason, the Tour features an easy-to-adjust recline. Using just one hand, simply push the button at the back of the seat and pull down. 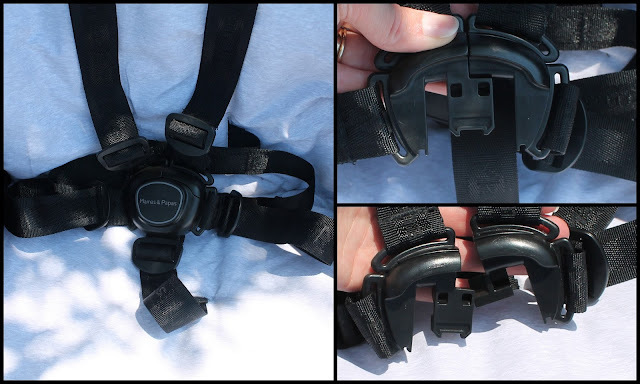 When you are ready to have your child sit upright, you’ll just hold onto the small gray plastic piece at the bottom of the straps and pull. The seat does not recline to a complete 180 degrees, but it certainly reclines to an acceptable sleeping position for your child. 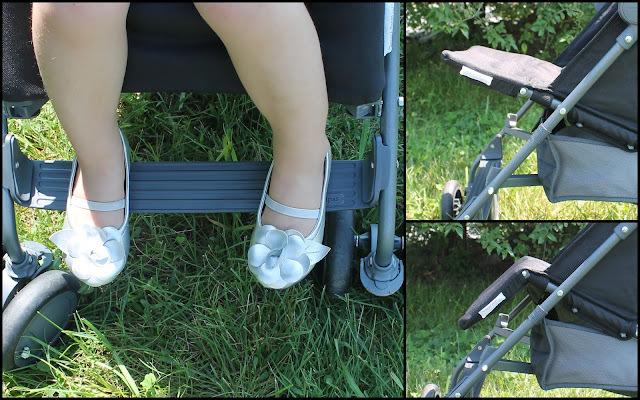 There is also an adjustable footrest for your child’s added comfort. Of course, safety is also very important when you are pushing your child in a stroller. While camping, we walked down a very steep, rocking hill at one point. It was nice to know that my son was securely strapped into his seat thanks to the 5-point harness. The wheels of the Tour are also adjustable to suit your needs. The back wheels lock (or unlock) with just one quick motion of the foot. 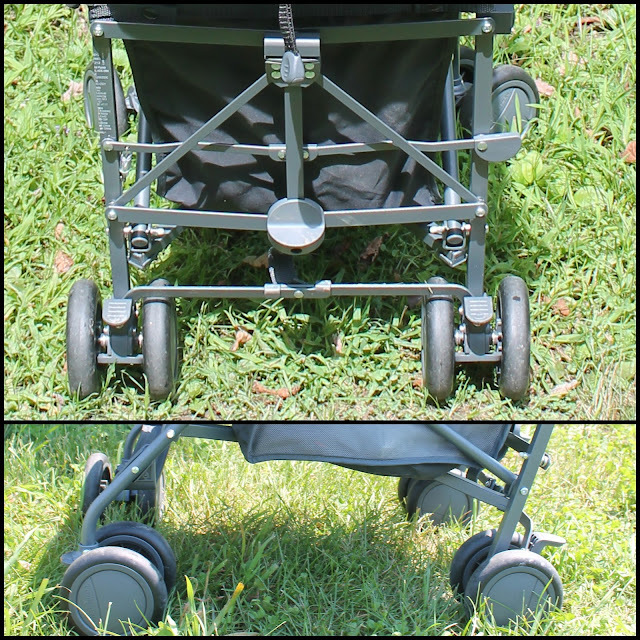 The front wheels can be locked into place, or unlocked for 360 degree rotation. 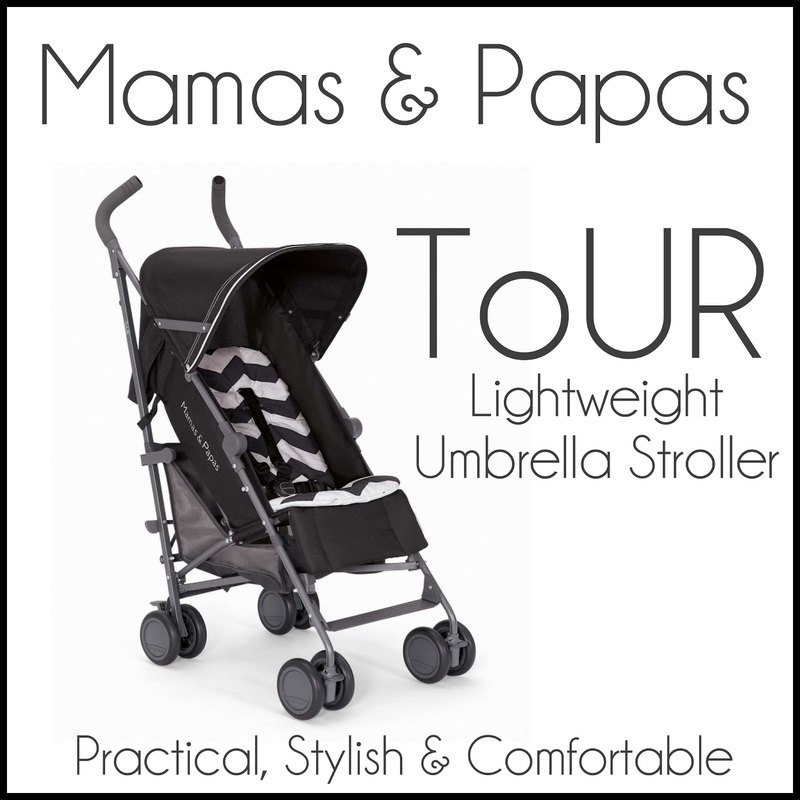 In conclusion, I want to say that I am in love my new Tour from Mamas & Papas! 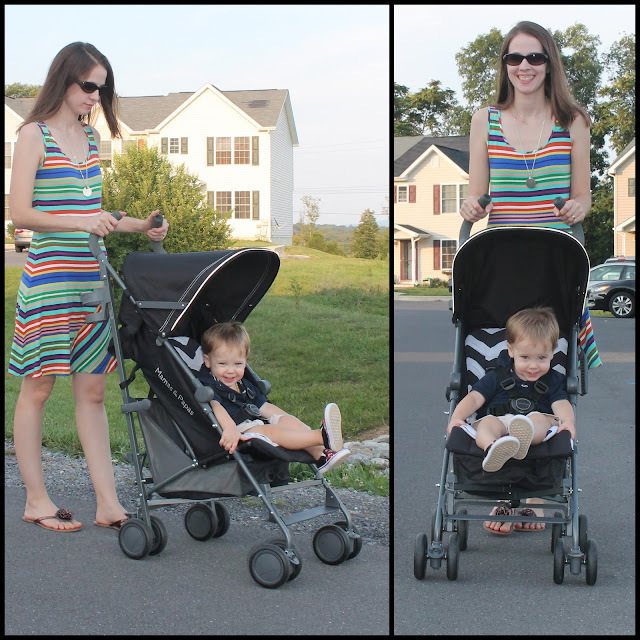 It’s practical meets comfort meets style, all wrapped up in one awesome seat on wheels! It’s a stroller that mom, dad and child will all enjoy. For those of you with two young children, you can also purchase the Tour as a double stroller–and yes, after taking the single for a spin, you know I want the double now as well! Connect: Visit the Mamas & Papas website, “like” their page on Facebook, and follow them on Twitter. 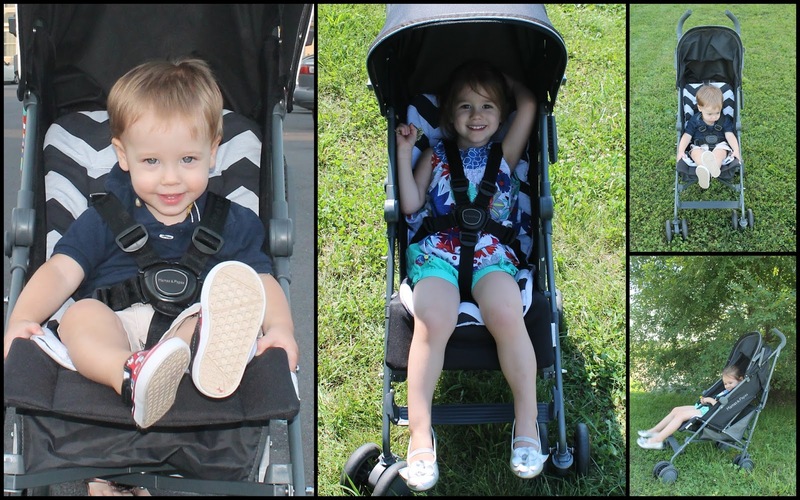 Buy: You can buy this stroller and more other awesome items directly from their website, or look for their items at Toys “R” Us/Babies “R” Us.